Recently, demand for maintainable and environment-friendly industry, so-called ‘green industry’ is increasing. As a part of this, renewable energy sources such as fuel cell, solar cell are being developed. On the other hand, also there are important aspects about methods of reducing energy usage. Current fossil fuel based industry consumes large amount of energy sources, wasting more than half of them because of inefficiency.Lighting devices are one of these inefficient parts. Lighting devices haven’t been developed dramatically since the incandescent lamp and fluorescent lamp was invented. Actually less concern were given to this part of industry than other mechanical device-based industry, though nowadays lightings consume about 20% of total energy consumption in the world. Recently necessity of reducing lighting power consumption became a big issue, and light-emitting diode (LED) is the most important device in this field. White LEDs for LED-based lighting industry were developed by S. Nakamura, from Japan. First blue LED chip was developed, which made LED devices can cover all visible light spectra. Combining this blue LED chip with phosphors emitting yellow light, white light is generated. This is the first and most widely used form of white LEDs. Also mixing red, green and blue LED chips together or using two different phosphors emitting green and red, white light is generated. 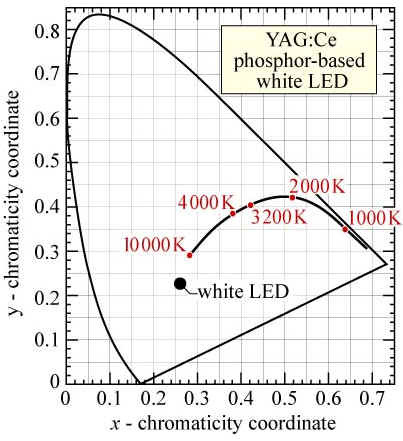 Current white LEDs are fabricated with blue LED chips (460nm emission) and yellow phosphors (YAG:Ce, absorption at 460nm and emission at 560nm). Yellow light emitting mechanism of cerium-doped YAG phosphor is 5d-4f orbital transition of electrons. In free ion state, energy difference of 5d orbital and 4f orbital in Ce3+ ion is around 51000cm-1. This is high energy, reaching to wavelength less than 200nm in UV region. In crystal fields, 4f orbital of cerium ion doesn’t change much and 5d orbital splits into 5 different energy levels. Among these levels the lowest 5d orbital is important for visible light absorption. Blue light of 460nm has energy corresponding to around 22000cm-1, so for the absorption at blue light wavelength range large energy splitting is necessary. Most of crystal materials including many kinds of oxide materials cannot make energy splitting of rare earth ions larger than 30000cm-1 from original free ion state. YAG has basically cubic crystal structure, and because of different diameters of atoms cubic unit cells become tilted dodecahedra. These phenomena assist larger energy splitting to occur by crystal fields, so that rare earth (cerium) ions doped in YAG crystal materials absorb 460nm blue light dominantly. After the absorption, electrons undergo red shift called ‘Stokes shift’. This is general phenomenon found in every crystalline phosphor materials, and this is an important wavelength-converting mechanism. In YAG:Ce phosphor, absorbed blue light is converted to yellow light, showing 460nm-550nm red shift. Yellow light from YAG:Ce phosphor is combined with blue light from LED chip, and generate white light. In the fabrication of white LEDs, polymer resins are used to make phosphor paste put on blue LED chips. However, recently developed LEDs for general lightings are high-powered, and while operating they can easily reach to the temperature around 200℃. In this temperature, polymer resins are degraded. Transparency and color properties of phosphor pastes decrease by this degradation, and this is one of main problems reduce lifetime of white LED lightings. Using glass materials as host of phosphor, first, thermal stability is enhanced. Glasses have high thermal and chemical stability, and show less deformation at high temperature. Especially optical characteristics such as transparency, reflection are almost maintained same at any temperature. Furthermore, they can be shaped into various morphologies. 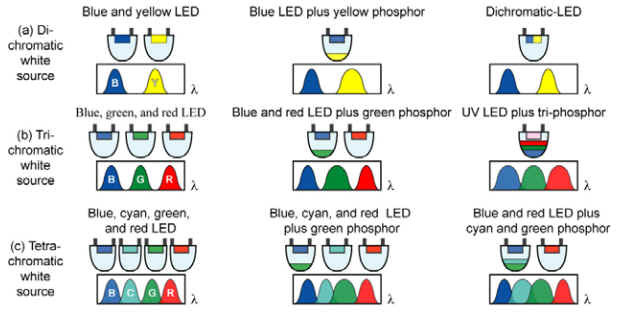 Morphology of phosphor topping is important for increasing the efficiency of white LED devices. YAG:Ce is chemically stable and emits yellow light with very high efficiency, but emitted light from YAG:Ce has spectrum center at 550nm, which is greenish-yellow light. Combining with 460nm blue LEDs, color temperature of generated white light is higher than 11,000K. Current white LEDs show bluish and snow-like cool white light only. 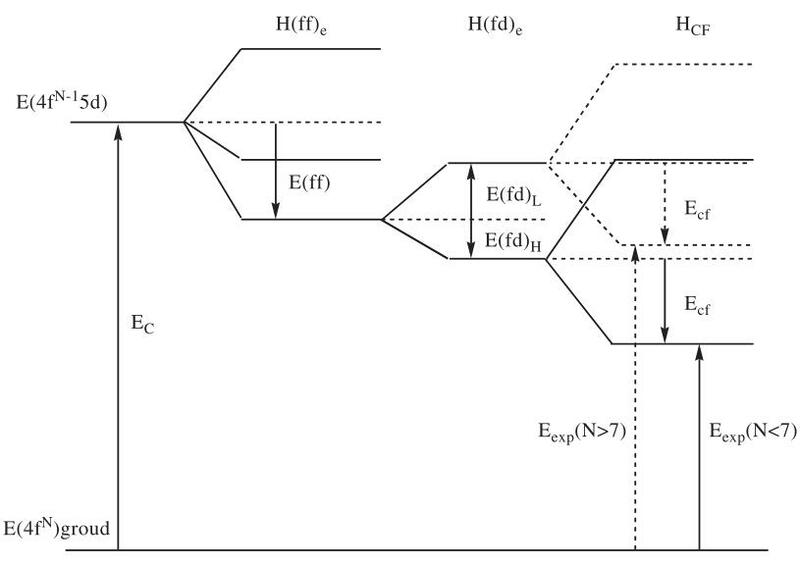 To solve this problem, reinforcement of phosphor in red light region is needed. There are several methods to lower down color temperatures of white LEDs. First, modifying crystal structures and compositions of phosphors can make different crystal fields and shift effects. However, this method is difficult since appropriate composition modification conditions are hard to find. Second, mixing two or more phosphors together is easy but optimized proportion of each phosphor and stable host materials are critical. Glass materials can be representative host materials for this purpose. YAG:Ce crystal has refractive index of around 1.8, and polymer resin used to make phosphor paste has 1.4. Because of this difference between phosphor and host, total internal reflection occurs inside phosphor particles. Trapped light can be a main cause of low efficiency, so high refractive index materials should be used to reduce this phenomenon. Glass materials commonly have 1.5~2.0 of refractive indices, so it is possible to dramatically increase light extraction efficiency used as host materials. Recently, handhold appliances, such as mobile phone, laptop, navigator, portable display devices, have been popular due to the development of electronic industry. Among these, glass materials play an important role for these appliances, not only the substrate for electronic devices but also for the cover glass to protect the panel away from damage, which can be created in the production process or by the end user. For cover glass, the strengthen parameter is the most important. Ion exchange is an excellent method to make glass stronger. The mechanism is that the larger ions are “stuffed” into the glass surface, creating a state of compression. In the ion-exchange process, the glass was immersed in the melted KNO3 liquid, smaller sodium ions leave the glass; the bigger K+ ions replace them. These larger ions take up more room and are pressed together when the glass cools, producing a layer of compressive stress on the surface of the glass. This compression layer acts as a sort of “armor,” making the glass exceptionally tough and damage resistant. Fig.1 shows the basic ion exchange process. 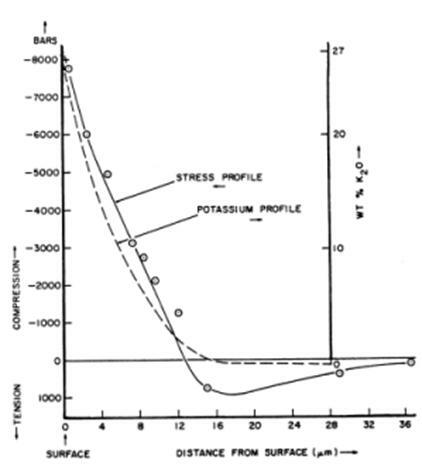 Where Di is the self-diffusion coefficient of i ion in the mixed alkali glass, not in the parent glass; Ni is the fractional concentration of alkali ion. The inter-diffusion coefficient is concentration dependent and is essentially controlled by the slower moving ions.